3 Above Ground Pools: Are They Really Worth It? With these scorching summer days we’re having, I bet you’re just counting the minutes until the weekend when you and your loved ones can have a nice and relaxing day at the local swimming pool or the beach. Well, what if you could install your own swimming pool in the backyard somewhere? But, what if you do not have the space for it? Even if you do have a large backyard, you might still have to settle the building permit and find a reliable and good contractor to account for. Let me tell you, chances are that you will be able to enjoy your own swimming pool in late August, when the summer is almost in its twilight days. Or not! The simplest solution for avoiding all the permit or contractor hassle and be able to cool during torrid summer days as soon as possible is purchasing an above-ground swimming pool. But, “won’t this cost me a fortune and only last a few months?” you might ask? Well, it depends on the pool that you buy. 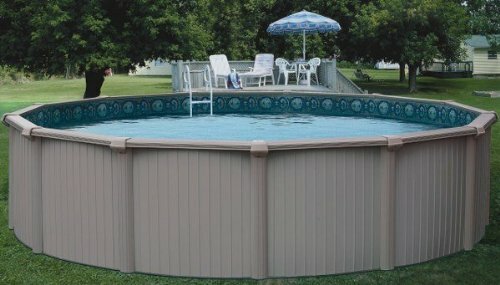 Introducing the 28 feet round 54 inches Bermuda aluminum above ground pool from Sharkline. While the name of the manufacturer itself is enough to inspire high quality and confidence, many other features recommend this pool as a good investment. Let’s look into this further. Manufactured by one of the leading swimming pool companies, the Bermuda 54” aluminum above ground pool has received a great deal of praises from customers and experts alike. Overall, the most appreciated feature of the Bermuda pool is the fact that it is made from aluminum, which unlike uncoated steel is not prone to rust or corrosion. In addition, the aluminum panels have a high-gloss and attractive enamel coating that further protects the metal from corrosion. Add the fact that parts are powder coated as well and you will understand why the Bermuda aluminum above-ground swimming pool is considered 100% protected. A further noteworthy feature of the Bermuda pool is the resilience of the aluminum. Sharkline managed to take pool construction to the next level by incorporating durable and strong enamel coating components. Essentially, the extra-gauge parts and interlocking walls utilized resulted in a 50% stronger build compared to the traditional stainless steel above-ground swimming pools. In fact, the resilience of the materials permits you to install the Bermuda as a semi in-ground pool as well. Above Ground Pools: Are They Really Worth It? Even though they are significantly more expensive and require more maintenance, many homeowners still prefer the in-ground swimming pools. However, before you disregard the economical and practical solution provided by them, it is necessary to point out that the above-ground swimming pools have come a long way since their early models. Simply put, manufacturers started focusing more on their looks and now, many models serve as exquisite and refined focal points in numerous backyards. We have mentioned that above ground pools allow you to enjoy all the benefits of an in-ground pool, but not that they can do so at a more affordable cost. In practice, these financial advantages mean that your property tax and insurance rates will not increase. In addition, you will not need to invest in a pool deck, fence or the appropriate lighting as mandated by the law. Lastly, the above-ground swimming pool will not entail costs regarding underground plumbing or money spent on repairing cracks. Stop daydreaming about having your own swimming pool or your weekends spent at the local pool and acquire the Bermuda 28ft Round 54in Aluminum Above Ground Pool. The accessible price, overall durability and why not admit it – its beautiful finish recommend it as one of the best above ground swimming pools on the market!